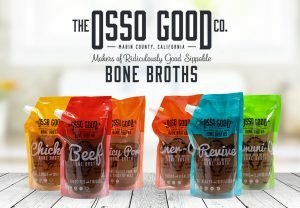 The Benefits of Drinking Bone Broth on a Gluten-Free Diet - The Osso Good Co. There are numerous benefits to drinking bone broth on a gluten-free diet. Not only is it helpful in promoting overall health and well-being, but there are also some specific advantages when you’re going gluten-free. You may be on a gluten-free diet for a variety of reasons — from just wanting better health to having a gluten intolerance or allergy. If you have a gluten sensitivity or allergy, stopping your consumption of foods containing gluten is only part of the battle. It’s important to heal the gut and reduce internal inflammation to counteract the negative effects of gluten. Bone broth is one easy way to do this. Bone broth is well known for its healing properties, and it can soothe and heal the intestinal lining for thorough healing and a stronger immune system. It promotes beneficial bacteria and helps protect your body and boost immunity on your road to better health. Being on a gluten-free diet can sometimes cause people to become deficient in certain minerals, vitamins, and nutrients that they need. Bone broth is very dense in nutrients, filled with essential vitamins and minerals like calcium, phosphorus, and magnesium, which the body needs to thrive. If you’re eating gluten-free products, consuming bone broth daily can help prevent your body from becoming deficient in the nutrients it needs. It’s also rich in protein (up to six grams per cup) so it can help provide the energy you crave. Not only is our bone broth Paleo-certified and naturally dairy- and gluten-free, it is easy to incorporate into a diet free of gluten. You can drink it alone and enjoy the rich, creamy texture, or use it in a wide variety of ways to make delicious snacks, meals, and beverages. Add favorite herbs or spices for an extra dose of flavor, or use it to cook gluten-free grains, rice dishes, or potato recipes. It can be used in gluten-free casseroles, as well as to thicken and add flavor to soups, stews, sauces, purees, gravies, and more. The rich flavor can enhance many of your favorite gluten-free foods. If you’re looking for a morning or afternoon pick-me-up, nothing could be more convenient than a ready-made package of bone broth to enjoy on the go. You can also just do simple things and add some small flavor enhancements, such as avocado or a dash of red pepper flakes, to change it up from having your bone broth alone. If you’re looking for more inspiration, get ideas and recipes on our Instagram page. Beneficial amino acids help regulate hormones and promote anti-aging. Bone broth helps detoxify the body to rid it of harmful substances. Collagen supports bone health and strength. Glucosamine in bone broth helps improve joint health and relieve joint pain. Protein and nutrients assist with weight loss or maintaining a healthy weight. Nutrients are absorbed quickly, providing energy, and immediate health benefits. Bone broth is rich in nutrients, important vitamins, and minerals to replace those that are lost and prevent deficiencies. Those with celiac disease or gluten sensitivities can get soothing relief and reduce intestinal inflammation by drinking bone broth. Enjoy a stronger immune system and increased energy. There are so many ways that bone broth can be beneficial for those on a gluten-free diet. Try it yourself and see the impact consuming bone broth regularly can have on your health!